This stunning and elegiac novel propelled Haruki Murakami into the forefront of the literary scene (and onto the Japanese bestseller lists) and showed that the master genre bender could tug at our heartstrings as effectively as the Beatles' song "Norwegian Wood." Toru, a quiet and preternaturally serious young college student in Tokyo, is devoted to Naoko, a beautiful and introspective young woman, but their mutual obsession is marked by the tragic death of their best friend years before. Toru begins to adapt to campus life and the loneliness and isolation he faces there, but Naoko finds the pressures and responsibilities of life unbearable. As she retreats further into her own world, Toru finds himself reaching out to others and drawn to a fiercely independent and sexually liberated young woman. A magnificent blending of the music, the mood, and the ethos that was the sixties with the story of one college student's romantic coming of age, Norwegian Wood brilliantly recaptures a young man's first, hopeless, and heroic love. Or should I say she once had me..."
I swear those lyrics have never encapsulated the essence of a novel more so than they do in Haruki Murakami's aptly titled book, Norwegian Wood. Seriously! Those two lines actually tell you what the story is all about - love. This is the love story of a guy named Toru who fell in love with a girl named Naoko; and from that moment on his life was never the same. It was a situation where he loved her more than she loved him and when that happens, well, hearts are inevitably broken and smashed into a gazillion pieces. Murakami has written a story that accurately captures and portrays the experience of falling in love, being in love, and the end of a love. He has described the emotional aspects so perfectly that I swear, I felt like I was reading my own story (okay, so I swapped Toru with me and Naoko with an ex-boyfriend, but you get what I mean). When Toru hears the song, Norwegian Wood, on a plane, he is struck hard by the song - it throws him back to a time in his life when his whole world was changed in ways he never imagined and all because of a girl named Naoko. And, who hasn't had that experience before, when you are listening to music and then a song comes on, and the next thing you know you are smiling fondly over the memory of the first time you went on a date with that guy whose smile just melted your heart? I swear that happens to me all the time - okay not just memories of first loves, but also memories of old friends who have passed out of my life or have passed away - like my best friend in college who loved boy bands and tight clothes (I swear she should have lived in the 80s instead of the 90s). One night we were making plans about how awesome our off campus apartment was going to be and all the fun we were going to have in our junior year of college, and the next thing I know I'm getting a knock at the door the next day and being told that she was no longer alive. It was a car crash. I swear I have never had the wind knocked out of me like I did that day. It was surreal. And to this day, whenever I hear music by cheesy boy bands like, Backstreet Boys or 'N Sync, I get a smile on my face and remember my best friend who made me laugh so hard that I cried. I'm pretty sure that she'd be loving Justin Bieber and One Direction and would be jamming out to those guys all the time. Its strange to think about how different things would be had she lived, but sometimes I do just that. That's the thing with music, it transports you to another time and place. And that is precisely what Murakami's writing has always done for me. I feel like his words just reach so deep into into me, that I can't help but feel as if I'm experiencing his story, not merely reading it. His ability to take me to new places, and sometimes to ones from my past is astounding and just goes to show what a talented author he is. The way his words evoke such strong reactions makes me almost feel as if his books are tangible - because they hit you so hard emotionally, you actually feel the pain and hurt. With this book, I couldn't help but think about the music he mentioned, which led me to listen to my old Beatles cds, and eventually caused me to remember some things from my past which I had long forgotten. It actually made for a nice reading experience and a reminder that sometimes the past is not as bad as you remember it. However, it wasn't just the music that had me feeling nostalgic - it was the books. Murakami mentioned several authors and book titles - some were familiar and some were not. But, in the end they reminded me of how much I love to read and how much books have influenced my world. Thinking of Fitzgerald reminded me of college and the ways in which literature seemed to transform me. I'd always been a reader, but it wasn't until college where I truly found myself obsessed with literature and realized that I wanted nothing more than to study it. Certain books remind me of certain times in my life - postmodern lit reminds me of the professor I had a massive crush on; Vonnegut reminds me of my attempt to work the word 'defenestration' into every conversation I had; and Cisneros reminds me of when I finally found an author whose works I could identify my Latina-ness with. 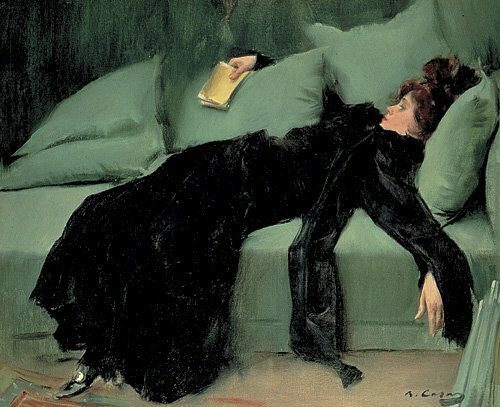 These authors and genres of literature remain an integral part of my reading repertoire and I love how familiar and comforting they feel to me. Murakami has become one of these authors - his words remind me what great writing is and they also reach me on a personal level and take me on interesting journeys. I swear that every time I read a Murakami novel, I'm usually feeling a bit out of sorts and somehow his books always seem to bring me back to feeling like my usual self. I wind up feeling refreshed and inspired after reading his work. With Norwegian Wood, not only did I feel nostalgic for my past, but I also felt excited for my present and future. The music I listen to remains a soundtrack for my life, just as the books I read still tend to reflect my moods. Thinking about everything Toru endures in the story, I found myself taking stock of my past, present, and future. The past may influence our decisions, but it certainly does not limit our futures - only we can limit ourselves. Toru was limiting himself with his decision to remain so faithful to Naoko and it broke my heart to see him depriving himself of a chance at true love; and so when I see him opening up to the possibilities before him, I smiled with joy, because I knew that he would be fine. That is what Murakami's stories do - they break your heart and then mend it; they open your eyes to possibilities; and they leave you reflective of your own life. 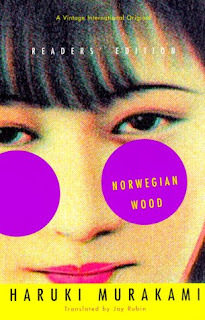 I am absolutely in love Norwegian Wood (the song and the book) and would most definitely recommend it to anyone looking for a great book to read. If you are a Murakmi fan, you will love it! And, if you are new to Murakami, you will love it! As for me, I'm off to read something Christmas-y, as I am feeling the holiday spirit. Happy reading! Labels: fiction, Haruki Murakami, Literature, Norwegian Wood, novel. This is a great review. Here's a question for you: if I disliked 1Q84, would I like this one? I was NOT a fan of that book, but I've been thinking about giving another Murakami novel a try, since so many people rave about him. Jennifer, I loved 1Q84 - it was awesome and crazy :) Definitely check out Norwegian Wood - it is soooo good! You will love it! Flawless review. Seriously! You hit this one out of the park! I love Murakami and I also feel energized after reading his books. I love when they were in the forest at the hospital. I wanted to live there. I might do a Wind-Up Bird read-along next year. I never did get to it this year. Ti, thanks so much! I just loved this book so much, that I wasn't even sure how to express how much I enjoyed the book. So, it took me awhile to figure out what to write. And yes, I would love to have live there, too :) You will love Wind-Up Bird - it is awesome! What a great review - I loved reading about how much this book struck a personal chord with you. Ti has been raving about Murakami for so long and this wonderful recommendation; it's time for me to get this one! Lisa, thanks! And, I know she has, hasn't she :) Definitely check him out - I think you will enjoy his work. "This is what Murakami's stories do-they break your heart and then mend it; they open your eyes to possibilities; and they leave you reflective of your own life." I love that line, and so many others, from your post. It's true, too, that this is the soundtrack of our lives. Bellezza, thanks so much ;) I'm glad you enjoyed my post - this book was just such an amazing read, as you well know. Cheers!